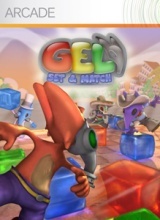 Gastronaut Studios brings the latest puzzle game to life on the Xbox Live Arcade with the release of “Gel: Set & Match”. It’s a well-known fact that the puzzle genre is one of the most flooded corners of the gaming world. Most of the games are either ripoffs or spinoffs, but the occasional diamond in the rough shows up and wows us all. This game isn’t necessarily a diamond, but it’s definitely one of the better puzzle titles out there in recent memory. From the tutorial and all the way out to the finale of the puzzle mode, this is one game that shouldn’t go unnoticed. It’s time for a trip into the puzzle-filled world of “Gel: Set & Match”. For a puzzle game, “Gel: Set & Match” has quite an impressive amount of visual quality. Not only does the game blaze along at 60 frames per second, but the lighting and gel animations are superb. The characters, while not completely original, are quite charming and nicely detailed. As far as the level design goes, there’s a decent bit of variation, ranging from sandy shores to a creepy graveyard. As far as the genre goes, this is as visually appealing as it gets. Good music tends to be a necessity to keep the pace flowing properly in good puzzle games, but in “Gel: Set & Match”, there just isn’t any truly catchy music. Sure, the sound effects are fairly cutesy and quite fitting, but this is one of those games that just feels better when the custom soundtrack feature is put to good use. Thankfully, that very feature almost completely eliminates that minor flaw. This is, without a doubt, one of the most enjoyable Xbox Live Arcade puzzle experiences to date. There’s a bit of everything here, with three full modes to choose from. The modes include Puzzle, Action and Battle selections, all of which have the same control scheme, but a different style of gameplay. Puzzle mode is exactly what the name implies and requires a lot of thought and concentration in order to clear the 120+ included levels. Action mode plays the same way, but requires a bit of reflexive action in most cases and rather than having a “Par”, you’re limited in different ways, such as a tank following behind you that loses health every time it runs over a gel block. Battle mode includes three full separate modes, each of which is a minigame with a different set of rules. The three Battle mode games are Fever Points, Volleybomb and Emblems. Of them, my personal favorite is Volleybomb, which is an obvious spin on Volleyball. Puzzle and Action modes can be played single player, but there are both local and online multiplayer options for every mode in the game. The online play is lag-free and generally pretty active, which adds even more to the already addictive qualities of this stellar title. To top it off, the actual gameplay is handled with a very basic control scheme that just about anyone is sure to pick up and master within’ seconds. The left joystick and d-pad both control character movement, while the A and B buttons control picking up, throwing and dropping the gel blocks. In application, your goal is far more complex than it sounds; match up four or more gel blocks of the same color in order to remove them from the playing field. Every mode shares this same basic objective, but it’s used in very creative ways to make each and every mode feel very unique. Factoring in every level and the addictive qualities of battle mode, this game is sure to last quite some time for any puzzle game fanatic. Puzzle mode alone is guaranteed to take a long while to complete perfectly. Overall, Gastronaut Studios has made me a happy man. It’s been a while since I’ve had this much fun with an XBLA puzzle game. This is a great addition to anyone puzzle fan’s collection. Keep up the good work, guys! -Stunning visuals for a puzzle game. -3 full modes with 6 different styles of gameplay. -Multiplayer is available both on and offline in every mode. -Music is pretty low quality. -Some puzzles will give casual gamers a headache. Puzzle fans shouldn’t even stop to think about this one. Buy it immediately! Others may want to check out the trial before making the jump.